Welcome to A. K. Industrial Fabrics, Manufacturer and Exporter of Industrial Textiles. An ISO 9001 2008 certified company, established in 1983 at Kanpur. Middle East, US, Australia and African countries are some of our major markets. Superior quality products, Expedite delivery schedules and industry leading prices are some of the key factors behind our success. We offer a huge gamut of Canvas Clothes, Cotton Canvas and Polyester Cotton Canvas. We are engaged in offering supreme quality Dyed, Waxed Proof Canvas and Water Repellent Fabrics that are a class apart. Twill Drill and Sheeting Clothes offered by us are best in the industry amongst others. 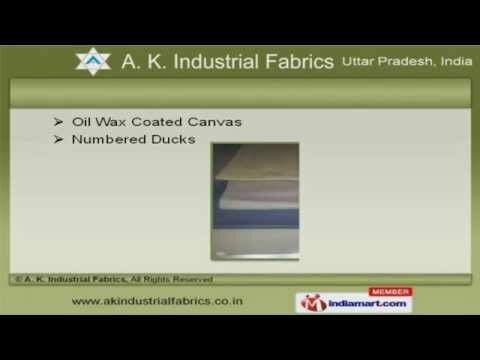 We have gained tremendous expertise in providing Numbered Ducks and Oil Wax Coated Canvas that are cost effective. Our Tent Canvas Fabrics and Dyed Canvas for Tent Industry are some of our best selling products. Our organization is instrumental in offering a wide gamut of Numbered Ducks for Bags Factory and Cotton Canvas for Tent Industry.